Today's video is the last video for February's Scrappin' on a Dime Series. I hope you enjoyed this month long series and I look forward to working on more soon. 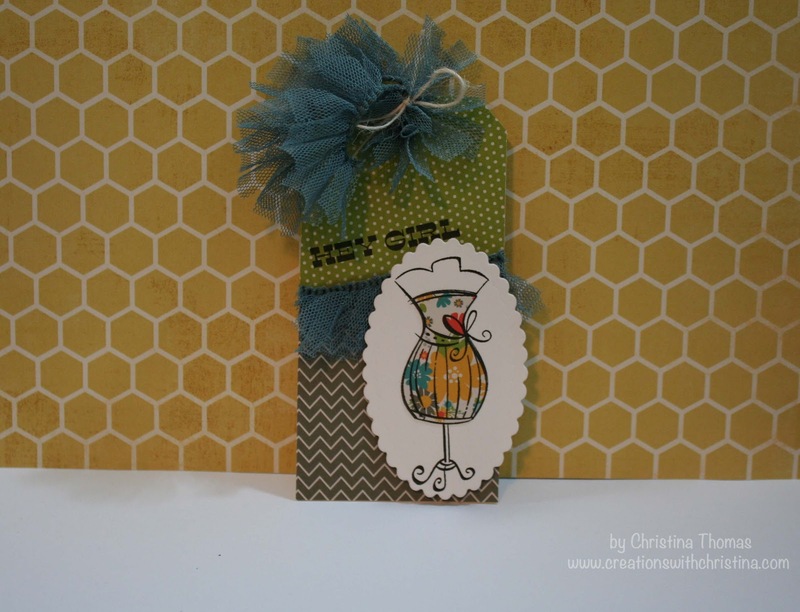 Today's video is a tag using the Seen and Noted papers along with the dress form from Sew Lovely. I love paper piecing using pattern papers :) So much fun. At the end of the video there is some bonus footage of two other projects I've used the paper collection for. One was my sketch book (see original post HERE) and the other was a week of Project Life. Here is a photo of the completed tag. Below you will find a link to all the videos for this month's series. I hope you enjoyed it and it inspired you to use your products. I have so enjoyed this series and look forward to more. We all need help to better use our products. We see new things or find great bargins and have so many ideas when we buy them and so many time we just fizzle out. Thanks for this series...one of the best. I am encouraged to bring out more of my stash and challenge myself to stop buying more, more, more!! I have really enjoyed this series this month Christina Thank You for sharing this! Love this series and hate to see the month end. Hope you do another one real soon. Enjoyed your other projects too! Thank you so much. Love this series - haven't not like a single series come to think of it, but this one has really inspired me to go from paper collector to paper user. I tend to do only one or two projects with a stamp set - this series will change that for me! Keep them coming!! I've enjoyed this month Christina. I can't believe how much stuff is in my room that I've never opened, but HAD to have. I think maybe I'm a hoarder! I've been a follower of yours for several years and learn something new from all your videos. Thank you for sharing your talent with us.